Barry Steenkamp testifies at former Paralympian Oscar Pistorius' sentencing for the murder of Reeva Steenkamp at the Pretoria High Court, South Africa, June 14, 2016. The father of Reeva Steenkamp gave heartbreaking testimony Tuesday as Oscar Pistorius' sentencing hearing continued. Barry Steenkamp says his daughter’s death “devastated” him and his family — and that Pistorius needs to “pay for his crime.” The superstar athlete faces at least 15 years in jail for murdering his girlfriend. A father’s pain, laid bare. Gerrie Nel: Mr. Steenkamp, do you still think of Reeva? Barry Steenkamp’s hands and body shook as he told Judge Thokozile Masipa and her rapt courtroom about his youngest daughter. The law graduate and aspiring model was 29-years-old when she killed by her boyfriend, superstar athlete Oscar Pistorius. 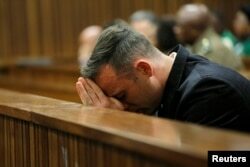 Her father was called to testify at Pistorius’ sentencing hearing in Pretoria. The athlete was convicted of murder last year and now faces a minimum sentence of 15 years. Pistorius sat in the dock with his head bowed, occasionally clutching his head in his hands, as Steenkamp spoke to the court for the first time since this headline case began in 2014. Former Paralympian Oscar Pistorius appears for sentencing for the murder of Reeva Steenkamp at the Pretoria High Court, South Africa, June 14, 2016. During the trial, Pistorius claimed that he mistook Steenkamp for an intruder when he shot four times through a locked bathroom door, killing her, on the night of Valentine’s Day, 2013. Prosecutors argued that he meant to kill Steenkamp. Steenkamp told the court of how the shock of his daughter’s death led to his stroke two months later, and to his continuing heart and health problems. He told the court how he and his wife were “virtually bankrupt” after Reeva’s death and were ordered to leave their home — and how they reluctantly accepted money from Pistorius. June, he says, has forgiven because she’s a Christian. “But then you must understand, while forgiving like that, it still does not exonerate you from the crime that you committed. So he must still understand that he must have to pay for that, although that June has forgiven him so that she can carry on with her life. … Oscar has to pay for what he did,” he said. FILE - South African Olympic athlete Oscar Pistorius and Reeva Steenkamp at an awards ceremony, in Johannesburg, South Africa, Nov. 4, 2012. Steenkamp declined to recommend a sentence, and said he deferred to Masipa’s judgement. In 2014, she convicted Pistorius of culpable homicide — equivalent to the U.S. charge of manslaughter — and gave him a five-year sentence. He was released on parole in October after a year of time served, only to see his conviction overturned by an appeals court and replaced with a murder conviction in December. Now, Masipa will have to choose a sentence to fit a murder conviction — South Africa does not hold jury trials. But Pistorius’ dogged legal team is not giving up. On Monday, the first day of the hearing, his defense presented a psychologist who said that he is now a “broken man” and needs hospitalization, not imprisonment.